After a rather unengaging six hours spent at Michigan’s Adventure, I had only planned on assigning a single day to Six Flags Great America, just a ferry ride away across the waters of Lake Michigan located in the VIllage of Gurnee, Illinois. But the park surprised me with much more to take in than I anticipated, and I ended up spending two days instead. Six Flags Great America, satellite view. Click for Google Map link. Seeing the success of Disneyland clones like Six Flags Over Texas and its sequel Six Flags Over Georgia, in the early 1970s the Marriott Corporation sought to expand their core hospitality business and get in on the action. The company wisely took advantage of the coming American Bicentennial and planned two sister theme parks called “Great America” as a tribute to the history of the United States. Both Great America parks—this one in Illinois between Chicago and Milwaukee, and the other in Northern California near the Bay Area—were liberally sprinkled with the Disney design approach to nostalgia: a narrow-gauge railroad circling the property, vernacular architecture rendered in forced perspective, individually themed lands—it’s all there. Even a weenie! Rather than a castle at the end of a main street, drawing the public forward, at the Great America parks a double-decker carousel sits at the end of a long pool. In Illinois it’s known as the Columbia Carousel, and out in California it’s known—conversely—as the Carousel Columbia (where it still remains the world’s tallest carousel). Six Flags Great America 2017 park map. The California park opened on March 20, 1976 and its counterpart in Illinois followed on May 29. 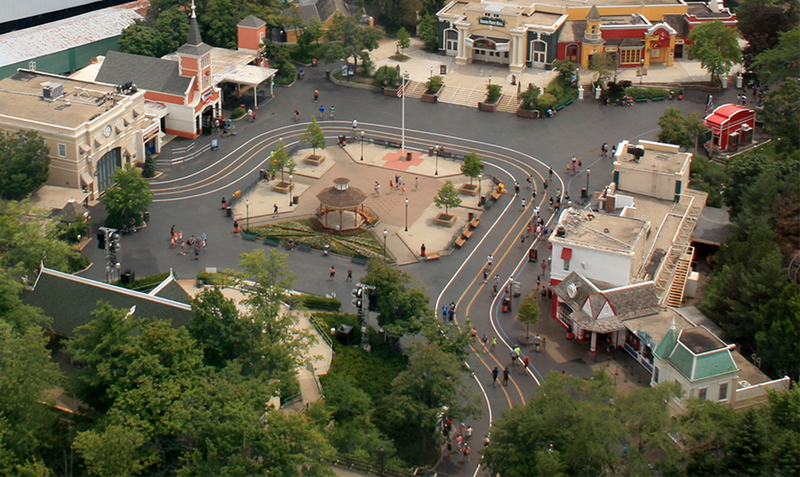 Yet just like Kings Island and Kings Dominion, the layout and design of the sister parks has diverged over the years. I guess it’s like two twins who are born identical, but then develop their own unique characteristics and personality—personhood—as they mature. And even more distinctly so if the twins grow up in different environments. Six Flags Great America 1987 souvenir park map poster. After Marriot divested of them to focus on its hotels, the Great America parks went through a series of various owners. Six Flags has owned the Illinois park—in one corporate guise or another—since 1984. The California park went much the way of Kings Island, being owned first by Paramount and then passing to Cedar Fair in 2006. Thus since the 1980s, the changes to each park have been unique, but the focus has been the same—an emphasis on roller coasters and more traditional amusement park rides. California’s Great America (left) as compared with Six Flags Great America (right). In California, Great America has been hemmed in on all sides in the City of Santa Clara by housing developments, business parks, and even a sports stadium. Conversely, in Illinois the park was built well outside Chicago in the Village of Gurnee, which was pretty much in the middle of nowhere back in the 1970s, and still remains somewhat so today. Thus Six Flags America has had ample berth to widen beyond the original park boundaries; California’s Great America, much less so. Both Great America parks feature an Intamin Gyro tower ride just to the right of Carousel Plaza. The Gurnee park’s version is called the Sky Trek Tower. Up in the tower there are magnificent views from some 300 feet in the air. What struck me the most was how much more verdant this Great America park is compared with the one in California. There are dense trees surrounding each and every land, and it really adds significantly to the charm of the place. Original organization of Great America, with “Duell Loop” and central service corridor. Both Great America parks were designed by Southern California firm R. Duell & Associates. Like nearly every creative professional who came to practice thematic design, Randall Duell began his career as an architect but struggled to find work in that field during the Great Depression, so he took jobs for Hollywood movie studios as an art director. He had over 30 MGM titles to his credits, including The Wizard of Oz (1939) Singin’ in the Rain (1952), when he left the business in 1959. 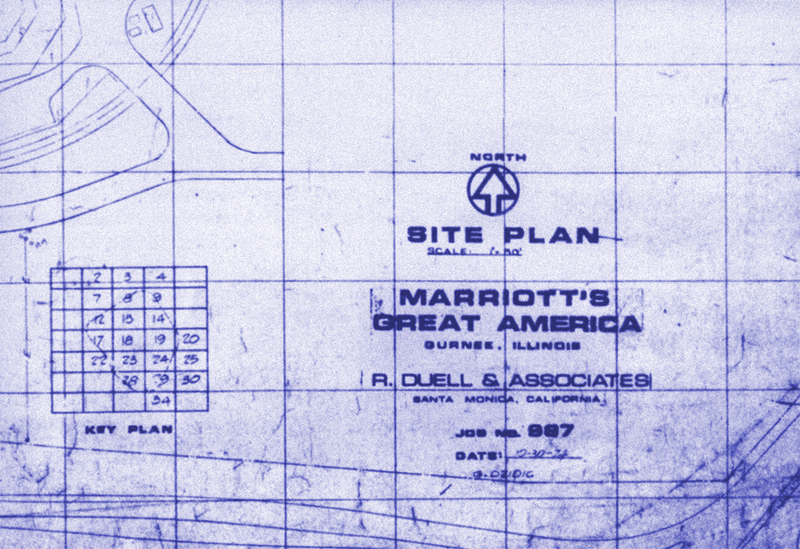 Blue-line site plan dated October 30, 1974. Duell first collaborated with C.V. Wood and Wade Rubottom on the failed Freedomland U.S.A. theme park in The Bronx, New York before founding R. Duell & Associates in the early 1960s. 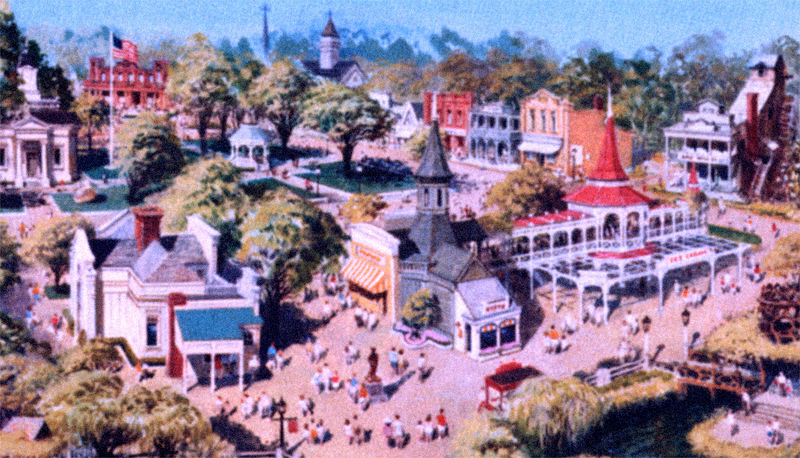 That park had featured many Disneyland-esque elements which would return in Duell’s subsequent park designs, the first of which was Six Flags Over Texas, which his company developed for Angus G. Wynne. 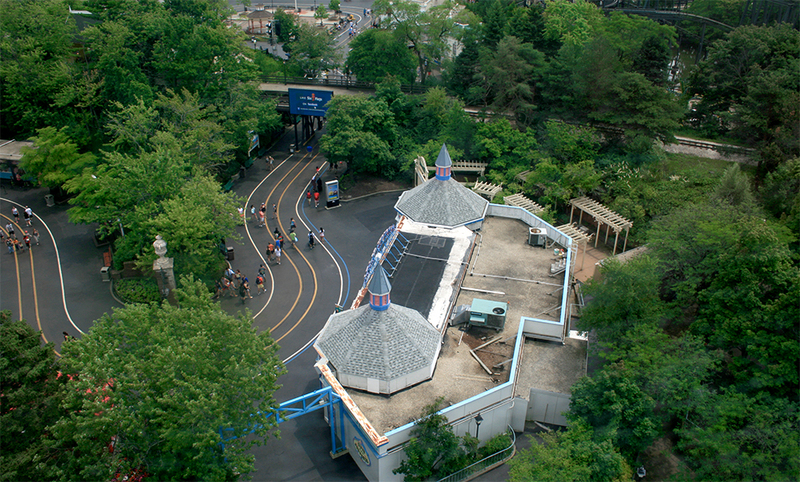 It opened in 1961 and serves as the basis for the Six Flags chain we know today. Service corridor as seen on a concept painting of the Gurnee park. Characteristic of his Texas project was Wynne’s desire to ‘one-up’ Disneyland, and one way in which Duell and his design team did that was in proposing a loop instead of a hub-and-spoke model. 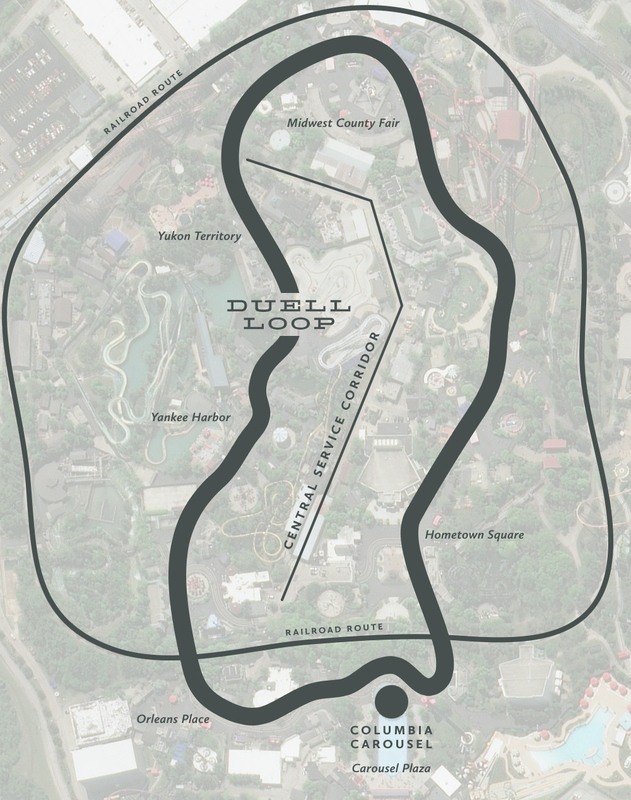 Duell repeated this device so many times at the parks he designed that industry folks still refer to it as the Duell Loop. 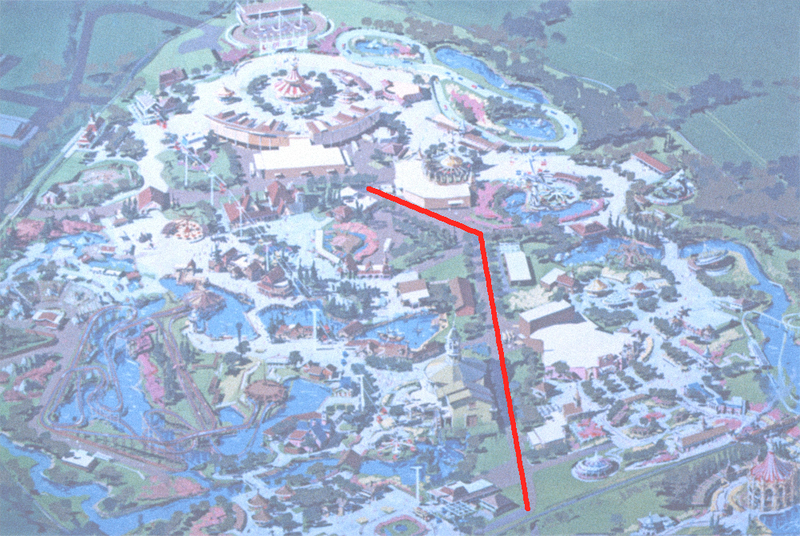 In the Great America model, there is a service corridor placed through the middle section which allows the various lands to be serviced without disrupting the flow of guests. Great America under construction, winter of 1975–76. The original themed areas or ‘lands’ within the design of both Great America parks on their respective opening days (clockwise from entry) were Carousel Plaza, Orleans Place, Yukon Territory, The Great Midwest Livestock Exposition at County Fair (now just County Fair), and Hometown Square. In 1996, Southwest Territory was finally added to the park, outside the railroad berm to the right of the square. Another tradition borrowed from Disneyland are framed promotional posters on display throughout the park. Unlike Disney, however, here at Great America there is a poster for each land as opposed to individual attractions. When Disneyland operated under the original A–E ticket system, such posters served to advertise the park’s offerings to guests—especially ones they might overlook. In the era of single-ticket admission, they only serve a commemorative, perhaps nostalgic purpose. The illustration style for this poster series reminds me very much of those drawn for Knott’s Berry Farm in the early 1980s—it’s painterly but somewhat cartoonish at the same time. The Orleans Place poster features the Arrow steel coaster ShockWave (1988–2002) and Yankee Harbor one sports Bolliger & Mabillard’s inverted prototype Batman: The Ride which was added in 1992. Country Fair shows the Sky Whirl prominently at front and center, which was removed in 2000. So I suspect these posters were commissioned for Great America’s 20th anniversary in 1996. As you enter the park at Carousel Plaza, there isn’t much of a theme, other than “amusement park-ness.” The structures resemble traditional boardwalks and midways, like those found at Cedar Point or Coney Island. It’s not unlike the “Victorian Gingerbread” found at many theme parks. And to American eyes, at least, this is all that’s needed. 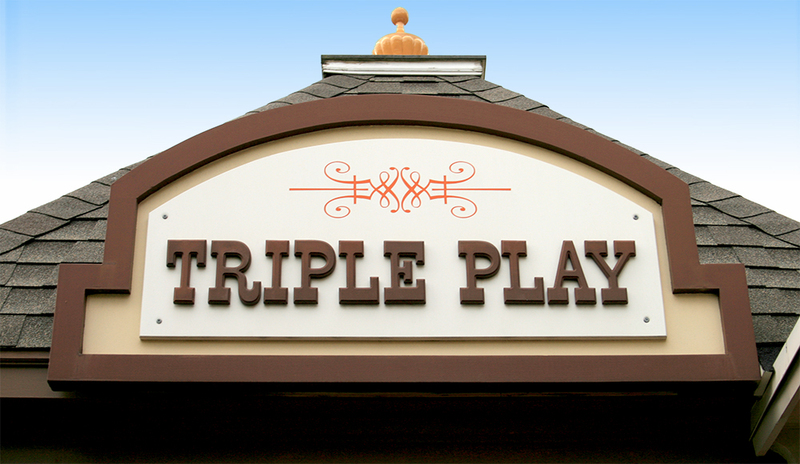 All signage is rendered in the expected Circus Wood Type look. It’s nice to see graphics like this actually routed in wood and hand-painted, as opposed to the plastic variety found at most other Six Flags and Cedar Fair parks. I’ve visited California’s Great America several times, and it only took the first twenty minutes or so inside the Six Flags version to judge it superior. More of the original thematic design from the Marriott era remains, the landscaping is thoughtful, and the changes and expansions over the years have been well considered and executed throughout. Concept painting of the Hometown Square area. All the areas of Great America were thoroughly rendered as concept paintings and illustrations by Duell’s design team, just as the Disney imagineers were accustomed to doing. And also like at Disney, what ended up being actually constructed was a scaled back version of the original vision. 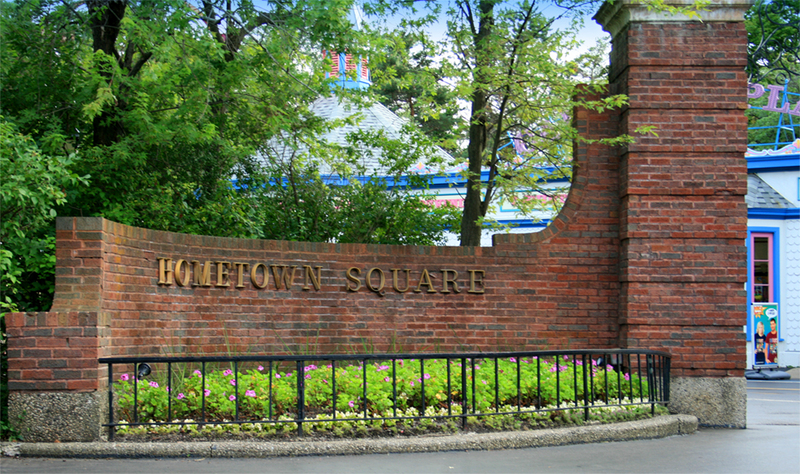 Once you walk around the Columbia Carousel, there are two brick entry points, one for Hometown Square (to the right) and one for Orleans Place (to the left). They appear identical to their California counterparts, and their placement bothered me in the same way—the entrances are not laid out symmetrically, and they’re both outside the railroad berm. In fact, the entire Orleans Place area is outside the berm. To the right as you enter the Hometown Square area is a page right out of the Disneyland Main Street U.S.A. playbook, although it seemed to my eyes at least that the forced perspective has been executed less skillfully. Paint schemes are both lively and authentic, however, and don’t suffer from a 1990s mall-like, garish genericization as seen on International Street at Kings Island. I do wonder why Duell’s design team chose only a Town Square, as opposed to the more thematically traditional Main Street model. One book I refer back to over and over again is historian Richard V. Francaviglia’s Main Street Revisited: Time, Space, and Image Building in Small-Town America (1996). The text explores the genealogy of the American Small Town throughout different regions of the country, and explores the illusions we have in our imagination of these places as filtered through film, television, and theme parks. Francaviglia notes that the Town Square was imported from Europe and took root predominantly in New England. It was also established in the Southwest as a result of Spanish influence. But somewhere in the middle of the country (Ohio, Indiana, and Illinois) the Main Street model became more popular, and this extended through the Plains to the Rockies and eventually to the American West. Disney’s Magic Kingdom-style parks do feature a Town Square at the entrance which then connects to the rest of Main Street U.S.A. and leads down to the castle. Yet there’s an irony here at Great America: Walt Disney brought the Midwestern Main Street from his hometown memories of Marceline, Missouri to Southern California. And Randall Duell brought the Town Square from his design firm in Southern California (where the Spanish had built Zocalos, or Town Squares). to Gurnee, Illinois—the region where the Main Street model originated. It could just be that doing a small town Main Street in cute Victorian trimmings would have been too direct of a lift from Disneyland, and Duell’s designers—whether creatively or legally—were reluctant to go there. Which is why I found this particular structure, first on the right as you enter the square, supremely odd. There appears to be a small residence of some kind on the second floor. And even during the day, there is a single lamp illuminated inside. To me this smacked directly of Walt Disney’s famous apartment above the Firehouse on Main Street U.S.A. As the story goes, Walt asked for this small residence to be incorporated into the park’s design so that he could stay overnight at Disneyland as the long hours of construction neared completion. Walt stayed in the apartment frequently, often with family members, in the years after the park opened. Walt Disney passed away in December, 1966, and ever since, a single lamp remains lit during park hours day and night as a sort of ‘eternal flame’ tribute. I don’t know if this similar presentation in Hometown Square at Great America is a coincidence or not, but there’s the lamp up in the window. I asked a couple park employees what was up on the second story and what the single light was all about, but neither had any idea. Mystery marked: unsolved. Opposite the park entrance at the far end of Hometown Square is the Grand Music Hall, and it was closed during my visit. 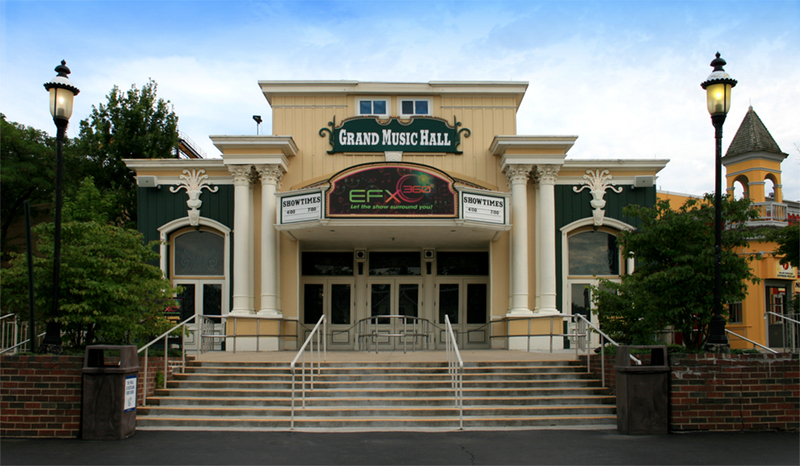 This did not surprise me, as live entertainment does not hold the same draw at theme parks that it had in decades past—comedy shows and musical revues used to play to packed houses like this one several times a day. I’m not sure if it’s because we’re in the age of the smartphones and streaming, but these shows simply don’t pull in the crowds anymore. Yet when Great America first opened, this venue was the hottest ticket in the park. Despite the various restaurant rebranding and vendor turnover which has undoubtedly occurred over the years, most of the structures I saw at Great America were decently maintained and retained their original charm (and paint schemes). There’s a single-room schoolhouse in the area of the square which appears to function as restroom facilities. At first I thought it might have been a historial relocation or re-creation, like at Knott’s Berry Farm, but I think it was simply designed thematically along with the rest of the park. Everything in Hometown Square is a sly and subtle mixture of Victorian Gingerbread with Midwestern Small Town elements, and Old Country Ranch with some Generic Americana thrown in. Again, I was pleasantly surprised to find so much actual routed wood type. Although the lettering treatment here screams “Seventies Strip Mall Laundromat,” it’s at least real painted wood, not plastic. This is the view of Hometown Square from the railroad station near the park entrance towards the Grand Music Hall. Forward and to the right lies the way to Midwest County Fair. Because of the central service corridor to the left, Orleans Place is accessed by going back towards Carousel Plaza and outside the railroad berm. The Hometown Square Railroad Station perhaps best illustrates the differences in design vision and attention to detail which set Disney apart from its many imitators and competitors. From the walls to the roofing to the interlocking cinder blocks and green railings, this feel more like a mobile home park in rural Illinois than a turn of the century train depot. Disneyland’s Main Street Station, 2007. Even setting scale aside, the grandeur of Disneyland’s primary railroad depot is obvious. And it’s not just a matter of money—construction costs for both Great America parks was 72.75 million in 1976 dollars (by comparison, Disneyland cost some $17 million in mid-century money). Just like at other Six Flags and Cedar Fair parks, it’s a matter of priorities. And the priority is thrill rides. And among all the thrilling roller coasters, it is nice that the attraction is here at all. The railroad and two train stations at California’s Great America were dismantled in 1999. Rather than the custom themed graphics found at Disneyland, the train station features actual antique sign reproductions. The Great America Scenic Railway is the same narrow gauge as the railroads at Disneyland, Cedar Point, Kings Island, and many other parks throughout the United States. In fact, one of Great America’s former locomotives (c. 1980) was traded to Disneyland, then later relocated to the Magic Kingdom at Walt Disney World, then sold to Cedar Fair, run at Knott’s Berry Farm, and finally returned to Cedar Point in 2010 and operates there today as the G.A. Boeckling. The railroad ride around the park was relaxing and cool, a result of the lush landscaping throughout. It felt different than either Disneyland (which has varying amounts of foliage and views of backstage areas throughout) or Cedar Point (with the views of Lake Michigan). The ride felt close to Kings Island in terms of feeling lost in the woods, but the route was far longer. The Midwest County Fair Railroad Station is of the same basic modest design as the one I left at Hometown Square, though I think it has a better paint scheme. Walt Disney’s design instincts have been proved right time and time again, and for certain, there’s just something about having a train circling a park. That’s probably why it’s the most oft-copied Disneyland feature found at parks across the country.